Under the umbrella term "anxiety disorder" a number of conditions are included, including generalized anxiety disorder (GAD), phobias, panic disorder, and post-traumatic stress. Characterized by disproportionate or ongoing worry, anxiety disorders can make daily life extremely difficult for the sufferer. While somebody with an anxiety disorder may be aware of the irrationality of excessiveness of their anxiety, they are usually unable to prevent it from negatively impacting their lifestyle. The following anti-anxiety herbs boast calming properties that could help manage the symptoms of stress or reduce the common anxiety caused by temporary circumstances. Anxiety disorders are the most common mental illnesses in the U.S., affecting 18% of the American population. Lemon balm is part of the mint family, and the herb's anxiolytic uses dates back as far as the Middle Ages. The leaves of lemon balm contain phytocompounds called terpenes, which are thought to be responsible for the herb's relaxing effects. A lemon balm and valerian anti-anxiety infusion can make wonders for your nerves, since the effectiveness of lemon balm leaves is maximized when it is used alongside other anxiolytic herbs. It's been suggested that the anxiolytic properties of passion flower rival those of prescription medicines. This is due to the plant's active compounds and their calming, muscle-relaxing effects. For that reason, the herb is used to treat panic disorder and generalized anxiety disorder (GAD). Passion flower has been shown to exert a sedative action, which may be of help in the treatment of anxiety-related sleep disorders. A soothing passion flower and saffron relaxant infusion can help provide relief after a long, stressful day. Among the herbs that help with anxiety, valerian has a well-deserved reputation. It has been suggested that consuming valerian root has a relaxing effect in social situations. The herb slows down the central nervous system, and it is therefore often used in combination with other anxiolytic herbs, such as lemon balm, for relieving stress. Valerian root is also valued for its sedative properties; when consumed continuously over a period of several weeks, the root can help relieve anxiety-related sleep disorders, such as insomnia. A warm cup of valerian tea blend for relaxation will put your body and brain into a calming state, so you can get a restful night of sleep. St. John's wort is widely used for treating both mental and physical ailments. Due to its sedative properties, St. John's wort has been used to treat minor to moderate symptoms of anxiety and panic disorders. It contains hypericin and hyperforin, which are chemical substances that act on mood-regulating messengers in the nervous system, regulating the levels of neurotransmitters in brain regions involved in depression and anxiety disorders. A warm cup of St. John's wort tea before going to bed will keep night terrors away. Studies have shown that linden leaves exhibit sedative and other anxiolytic properties that could help with managing the effects of anxiety. Preparations of the herb in supplementary forms can be consumed to this effect with no known adversity. A decoction of linden and lemon balm will bring you calmness and serenity, treating and preventing panic episodes. 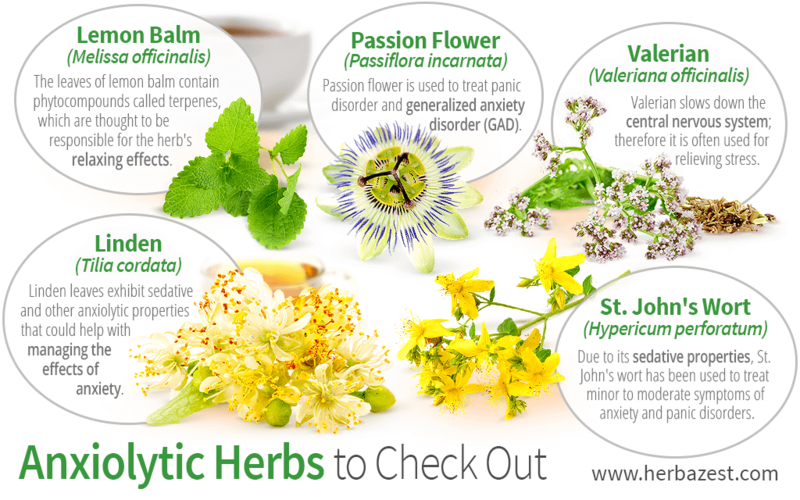 Managing an anxiety disorder - or even just managing a period of temporary stress - is by no means easy, and while anxiolytic herbs could help alleviate the effects of anxiety, they are unable to treat the specific cause of your worries. It's important to seek professional treatment for anxiety through a combination of therapy or counseling sessions, lifestyle changes, and medications, if necessary. Treating anxiety disorders takes time, effort, and patience - all of which are well worth it to achieve emotional balance and well-being.